"Relocating back from Australia, our client wanted to create a luxury retreat that felt like a home from home. The allocated space for the kitchen was very generous, so furniture proportions had to be seriously considered in the design. Somewhere to cook, socialise and take in the uninterrupted, breath-taking Salcombe sea views. 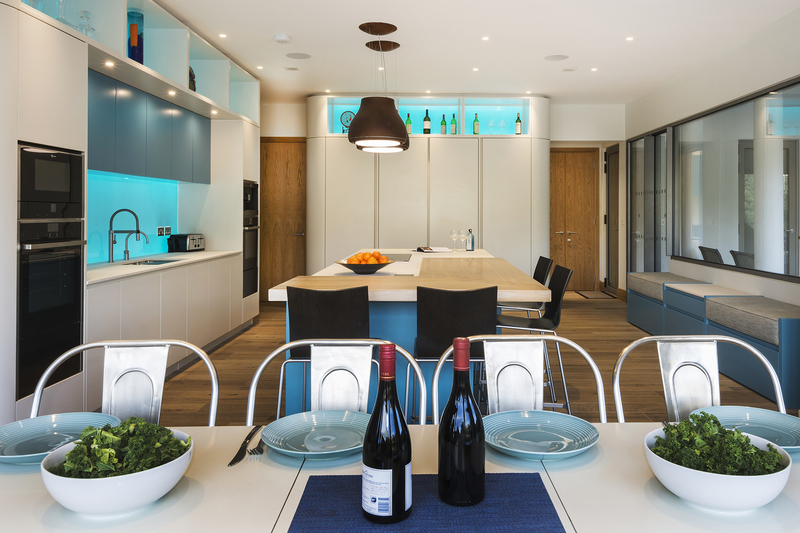 A place for entertaining and unwinding, with a colour scheme that brought the outside in. The tall curved ends to both tall banks of furniture helped with flow between the rooms adjacent, whilst providing much needed discrete storage. The Elica Diva extraction also provided task lighting around the cooking area, without looking too much like an extractor and the chunky character oak breakfast bar helped to break up the vast surface area of the island. The upholstered bench with integral towel storage was perfectly positioned for those wishing to prepare for taking a dip in the adjacent swimming pool, but it also doubled up as a low-level seating area. High level display boxes helped utilise spaces that are more difficult to reach and were backlit with the same ‘sea blue’ bespoke light sheet that is present in the sink area. Tucked away behind the main kitchen, a utility space to help declutter the kitchen was created; providing overspill storage and prep space, as well as accommodating two washing machines and a tumble dryer. "The former grade II listed former rectory that the client acquired was in need of extensive resurrection. Treyone were commissioned to create a kitchen and utility space with a strong, industrial feel, but with some features that were sympathetic to the building’s heritage. Hand forged copper handles tie in seamlessly with the (centrally featured) distressed copper island. With the Fisher & Paykel American fridge freezer tucked away in the utility, the main kitchen remains a space that is un-interrupted by bulky appliances - yet it still accommodates an under counter drawer fridge in the island for convenience. The client acquired a tired property in the tranquil village of Kingston, which was in need of complete renovation and extension to serve their requirements. As a holiday retreat, they wanted to create a destination for all of the family to enjoy on their frequent visits to Devon. Based in Birmingham, they had to feel comfortable working remotely with everyone involved in the project. They wished to create an environment that appreciated it's traditional surroundings, but did not shy away from the contemporary and industrial images that had filled their mood boards. Being an unusually deep space, they wanted to create 3 entwining zones of separate interest; the main kitchen, a dining area and a breakfast area. With the breakfast area, they needed someone to carefully take out the old pine kitchen, refurbish and rebuild it to facilitate the dining area. 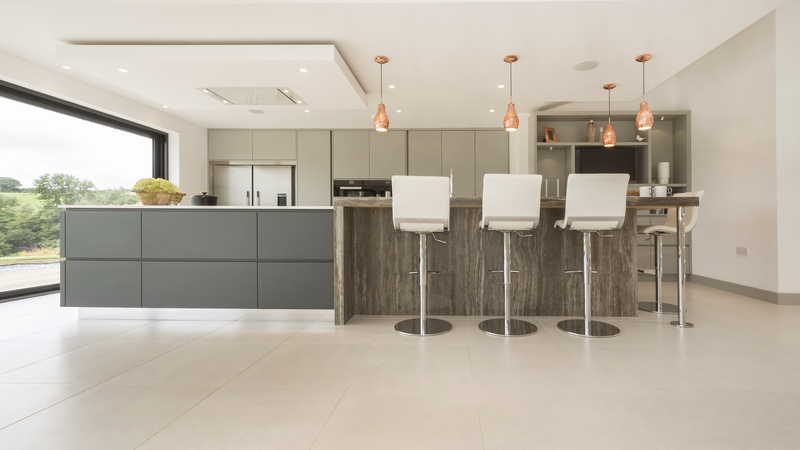 It was very important for them to up-cycle this furniture, whilst creating a contemporary kitchen that provided a stark, yet complimentary contrast to the old. Everything had to be intuitive and robust enough to withstand the cooking habits of differing family members. Seating at both ends of the kitchen would provide for socializing with the cook, or obtaining a decent viewing position of the TV. 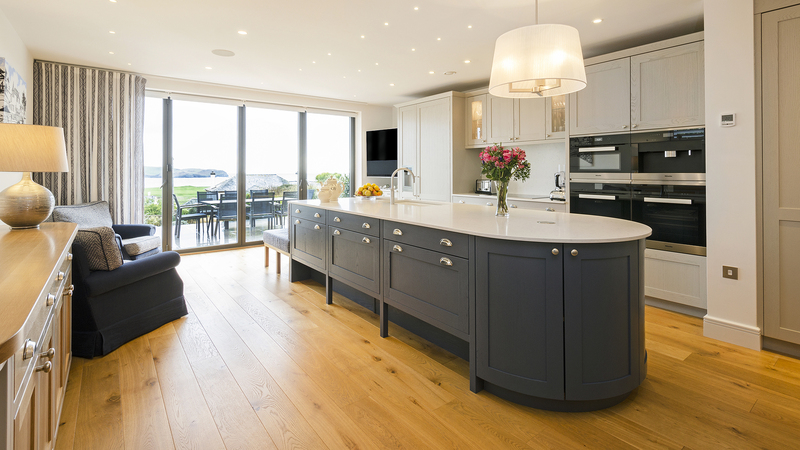 The client was keen to incorporate a tactile, timber element to the design, so we featured 60mm thick full stave European character oak to the island and referenced the old kitchen furniture to achieve a tint that linked the two zones. They loved the impact of Farrow & Ball 'Down Pipe' and wished to include this in the scheme. Combined with the timber and limestone floor finishes, this helped to provide a starting point. As the island was over 5.5 metres long, it was important to create features that broke up what would otherwise be an uninspiring bank of furniture. 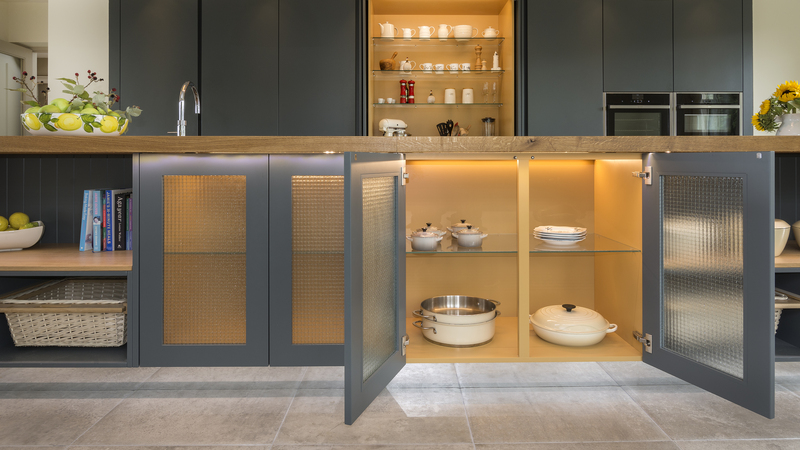 The Farrow & Ball 'India Yellow' accents, mesh glazed doors, low level display areas and pull out baskets helped achieve this. Mirrored plinths also help make the furniture seem less grounded, reflecting the floor finishes across large portions of space. The Neolith 'Phedra' worktops in the cooking and prep areas provided superior durability where it was needed, whilst the Neff venting hob omitted the need for any extraction overhead. They were unsure as to whether they needed more fridge or freezer space, so we incorporated the Fisher & Paykel Cooldrawer into the island, providing versatile 'over-spill' refrigeration that would adapt to their needs. The 2 zone push-to-open Miele wine cooler further helped to free up refrigeration space, whilst tying in perfectly with the handle-less door design. The Neff Slide & Hide Pyrolytic oven, combination microwave and warming drawer provide for the 'precision cooks' within the family; significantly increasing capacity to cooking on an Aga alone. The clients live in New York and love returning to the UK to see friends and family. For the 8-10 weeks that they spend here every year, they gradually started to out-grow the Salcombe property that they occupied whenever they visited. By acquiring the land directly opposite their holiday abode, they started to make plans to build the perfect holiday retreat back in 2006. 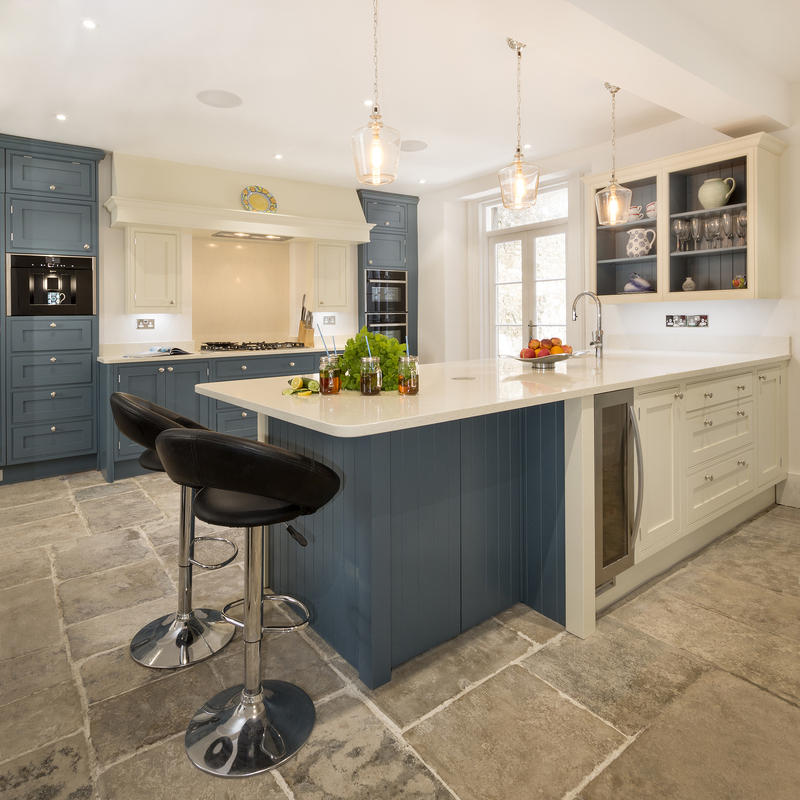 As they were very happy with the service that we offered on their previous kitchen project, they invited us to advise on the new property at planning stage. When the build started in 2017, Treyone were asked to revisit the original proposals. Our clients wanted to create a grand, open plan entertaining space that merged New England with a splash of industrial. As there would be often more than one cook in the kitchen, it was important to create two prep zones that could work independently from one another. Given the stunning views they inherited, it was important that the kitchen didn’t obscure any flow towards the outdoor areas that they had planned for. The client loved cooking with an Aga, but she was mindful that it would spend most of the year switched off. Being a new build property, it would also be well insulated, so particular attention had to be given as to the best type of Aga to suggest. For ‘higher output’ cooking, they wished to incorporate an induction hob, but wanted this to be as discrete as possible, as it would not be used very often. 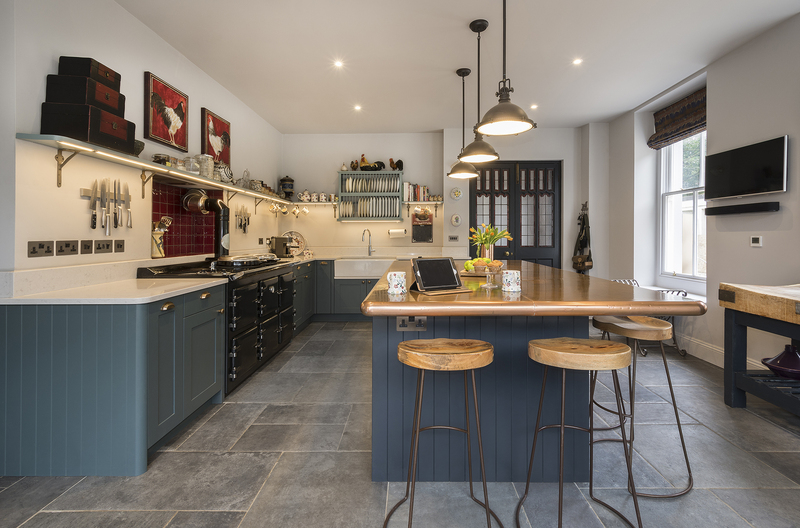 They fell in love with the distressed zinc worktop that we had in our Kingsbridge showroom and she wanted to incorporate this into the design. However, she also had Silestone worktops in New York and loved the practicalities that this offered. Working off plan, we had to work closely with the builder and architect to ensure that we could best utilise the space. The back of a staircase was encroaching into the room, so we had to build the tall housings to marry the pitched roof section in this area. All of the oak elements were tinted to match the floor finish to avoid the orange hues that one would normally associate with this type of timber. The ‘Holiday Mode’ setting on the Siemens ‘A Cool’ fridge and freezer helped maintain low running costs when they were away and the No Frost features on both appliances also ensured that they were not met with any unpleasant surprises each time they returned. We created an oak chopping board that could also be used as a cover for the Siemens induction hob, so it was out of sight when out of use. The zinc island worktop was a great success, tying in perfectly with the Giara Britannium finished handles and polished stainless steel Elica ‘Belle’ extractors. We created a tongue and groove panel to mount the extractors to, matching the finish of the ceiling immaculately. The Total Control 5 oven Aga can be completely switched off whenever they return home, requiring only a short amount of time to fire up to full heat when needed. Next to each sink, we incorporated an integrated Siemens dishwasher, offering a low 42db noise level. 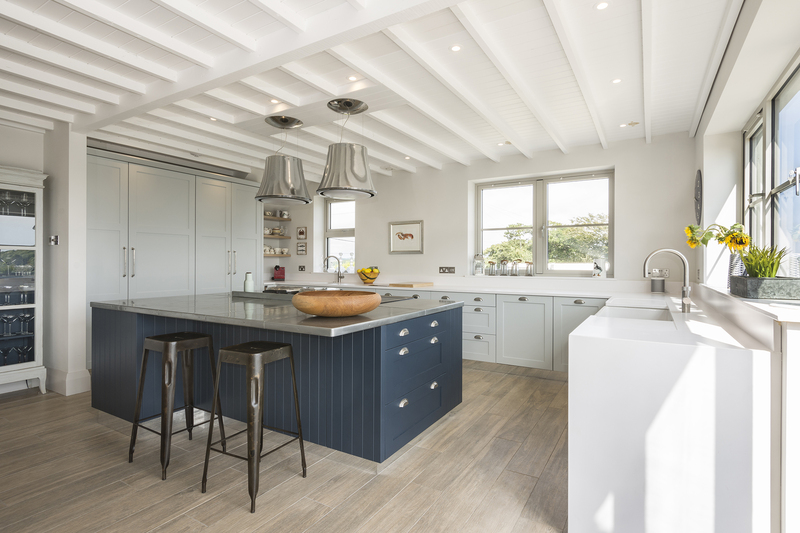 The clients are a retired couple, who first approached Treyone when they were in the process of downsizing and relocating from their Dartmouth farmhouse to a bespoke, modern coastal property in Thurlestone. The new property came with a virtually new high gloss, white, handle-less kitchen that did not speak of their tastes at all. They wanted to schedule the work required prior to moving into their new home, so they could start their project as soon as they were in possession of the keys. A lot of the furniture they had acquired over the years was traditional. It was key to embrace this when focusing on the design, whilst appreciating that the property itself was very contemporary. They wanted to incorporate a low-level seating area, where one could enjoy the sea views in the morning. They had an old circular breakfast table that they wished to up-cycle and incorporate into the footprint of the kitchen. As a sports enthusiast, Alan wanted to accommodate a 40” Bang & Olufsen TV, which could be rotated to achieve the perfect viewing angle from the breakfast area or sofa. They loved the texture of Ash, but did not want to add another ‘wood tone’ to the space. The room had to provide for a large dining table that they already owned, as well as space for two armchairs and a dresser. As the space was quite long (yet narrow), it was important to consider the spacing between each zone. As they were downsizing, plenty of storage had to be provided in order to accommodate the wealth of items they had acquired over the years. Drawers were preferred for ease of access and ideas to de-clutter work surfaces were welcomed. The appliances had to be intuitive and efficient, yet provide for a variety of cooking adventures. The work surfaces had to be durable enough to withstand the toughest of stains, as well as visits from the grandchildren. As they had underfloor heating, the positions of the waste and water supplies could not be altered and so the new kitchen had to be designed with this in mind. Treyone found a suitable candidate to purchase the kitchen and appliances inherited with the property and arranged the careful removal and delivery of this. The clients also wanted to take this opportunity to re-varnish the timber floors, alter lighting positions and re-decorate the entire space prior to the new kitchen being installed. Treyone helped coordinate this to achieve a smooth transition from one trade to another. We looked at the tint of the flooring to ensure that the oak elements of the kitchen would blend in seamlessly and not add a further tonal value to the space. We obtained the same material that was used to upholster the armchairs and used this to upholster the L shaped bench seat. This also helped inform the colour of the island and table legs, which were painted in Morris & Co. 'Indigo'. To help ensure that the back wall did not dominate too much, we paired back the furniture colour in this area to Farrow & Ball ‘Purbeck Stone’. The light mushroom tones also added a bit more warmth and provided a subtle contrast to the Lapitec worktops and wall cladding. It was important for the extractor to not be a visual showpiece, so we specified an Elica ‘Hidden’ extractor, which is both quiet and neatly tucked away out of sight within the furniture. To mirror the circular table, we incorporated a semi-circular unit to the opposite end of the island. The clients were extremely pleased with the result and have subsequently commissioned us to provide utility room, study and wine storage cabinetry. "The house, being an older property in Plymouth and the room being in the basement, meant that light was a factor. The lightness of the floor and the worktop chosen meant we could use a beautiful dark colour on the in-frame kitchen furniture without sacrificing any light.